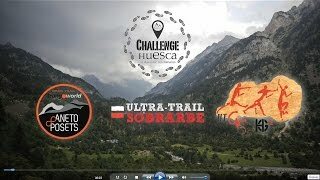 N 42° 8' 10" and W -0° 24' 31"
Huesca in Huesca (Aragon) with it's 52,059 citizens is a place in Spain about 208 mi (or 335 km) north-east of Madrid, the country's capital city. Current time in Huesca is now 07:16 PM (Monday). The local timezone is named Europe / Madrid with an UTC offset of 2 hours. We know of 10 airports near Huesca, of which two are larger airports. The closest is airport we know is Tarbes-Lourdes-Pyrénées Airport in France in a distance of 75 mi (or 121 km). The closest airport in Spain is Pamplona Airport in a distance of 77 mi (or 121 km), North. Besides the airports, there are other travel options available (check left side). There are several Unesco world heritage sites nearby. The closest heritage site in Spain is San Millán Yuso and Suso Monasteries in a distance of 39 mi (or 63 km), West. If you need a hotel, we compiled a list of available hotels close to the map centre further down the page. While being here, you might want to pay a visit to some of the following locations: Quicena, Tierz, Chimillas, Alerre and Banastas. To further explore this place, just scroll down and browse the available info. Let's start with some photos from the area. 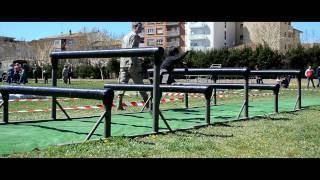 XXIV Certamen Nacional de Jota Ciudad de Huesca 2015, desde el Centro Cultural del Matadero. Organizado por la Asociación Cultural Acordanza. Fragmentos del certamen. Filmado el 17 de enero. 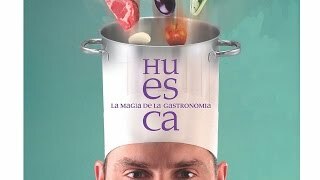 Presentación de la candidatura de Cambiar Huesca para las elecciones municipales de mayo de 2015. 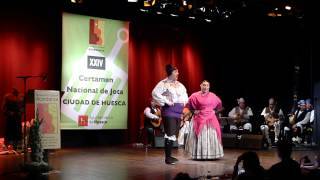 La comparsa de gigantes y cabezudos de Huesca bailando en el II Encuentro Aragonés de Consejos de Infancia y Adolescencia. Albero Bajo is a municipality located in the province of Huesca, Aragon, Spain. According to the 2004 census, the municipality has a population of 93 inhabitants. Located at 42.0167, -0.383333 (Lat. / Lng. ), about 8 miles away. Barbués is a municipality located in the province of Huesca, Aragon, Spain. According to the 2004 census, the municipality has a population of 108 inhabitants. Located at 41.9833, -0.416667 (Lat. / Lng. ), about 11 miles away. Nueno is a municipality located in the province of Huesca, Aragon, Spain. According to the 2008 census, the municipality has a population of 524 inhabitants. Located at 42.2667, -0.433333 (Lat. / Lng. ), about 9 miles away. Sangarrén is a municipality located in the province of Huesca, Aragon, Spain. According to the 2004 census, the municipality has a population of 274 inhabitants. Located at 42.0167, -0.433333 (Lat. / Lng. ), about 8 miles away. Tardienta is a municipality located in Huesca Province, Aragon, Spain. According to the 2004 census, the municipality has a population of 1,072 inhabitants. It is located on the Madrid–Barcelona high-speed rail line. Located at 41.9833, -0.533333 (Lat. / Lng. ), about 12 miles away. Torres de Barbués is a municipality located in the province of Huesca, Aragon, Spain. According to the 2004 census, the municipality has a population of 335 inhabitants. Located at 41.9667, -0.433333 (Lat. / Lng. ), about 12 miles away. Tramaced is a municipality located in the province of Huesca, Aragon, Spain. According to the 2004 census, the municipality has a population of 108 inhabitants. Located at 41.9667, -0.3 (Lat. / Lng. ), about 13 miles away. Vicién is a municipality located in the province of Huesca, Aragon, Spain. According to the 2004 census, the municipality has a population of 115 inhabitants. Located at 42.0458, -0.438889 (Lat. / Lng. ), about 6 miles away. Huesca-Pirineos Airport (Spanish: Aeropuerto de Huesca-Pirineos), also known as Huesca Airport, is the airport serving the province of Huesca in Spain. The airport is located 9 kilometres southeast of the city of Huesca, near the villages of Monflorite-Lascasas and Alcalá del Obispo. Most of the traffic at the airport is domestic, to and from cities including La Coruña, Madrid, and Valencia. Located at 42.0808, -0.323333 (Lat. / Lng. ), about 6 miles away. 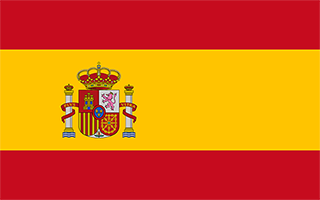 Siétamo is a municipality located in the province of Huesca, Aragon, Spain, in the comarca of Hoya de Huesca. Birthplace of the Count of Aranda and Cardinal Javierre. Located at 42.1167, -0.283333 (Lat. / Lng. ), about 7 miles away. Estadio El Alcoraz is the name of SD Huesca's football stadium. It was named after the battle of Alcoraz which took place there in 1096. It is located next to San Jorge's hill and it has a capacity of approximately 5,000 people. It was opened on January 16, 1972, since then it has witnessed many social and sport events such as a match between Spain's Under-21 national football team and Greece and a Copa del Rey match in 1991 between SD Huesca and Cádiz CF. Located at 42.1319, -0.424444 (Lat. / Lng. ), about 1 miles away. The Battle of Alcoraz took place in 1096 outside Huesca (Arabic Wasqah), pitting the besieging forces of Peter I of Aragon and Navarre against the relief forces of Al-Musta'in II of Zaragoza. The siege was begun some two years earlier (1094) by Peter's father, Sancho Ramírez, who had camped at the time in the Castle of Montearagón. While inspecting the siege efforts around the walls, Sancho was killed by an arrow. Located at 42.1536, -0.344167 (Lat. / Lng. ), about 4 miles away. The Castle of Montearagón is a former fortress-monastery in Quicena, near Huesca, Aragon, Spain, built in the Romanesque style. It is presently in ruins. In 1094 Sancho Ramirez reinforced the castle to help with the siege of the Muslim stronghold of Wasqah (Huesca); here he met his death by a stray arrow as he was reconnoitering the city's walls. The city was conquered in 1096 by Peter I of Aragon, after defeating the relief forces in the Battle of Alcoraz. Igriés is a small village located in the Hoya de Huesca, in the province of Aragón in northern Spain. Located at 42.2167, -0.433333 (Lat. / Lng. ), about 6 miles away. The Abbey of San Pedro el Viejo (Spanish: Monasterio de San Pedro el Viejo) is a former Benedictine monastery in the old town of Huesca, Aragon, Spain. The present Romanesque structure was built by the Benedictines in the 12th century. The name "San Pedro el Viejo", or "Saint Peter the Old", refers to the fact that the Visigothic monastery building that was given to them predated the Moorish occupation. The site now consists mostly of the cloisters and the church. Located at 42.1381, -0.407222 (Lat. / Lng. ), about 0 miles away. The Holy Cathedral of the Transfiguration of the Lord, also known as the Cathedral of Saint Mary Huesca, is a church in Huesca, north-eastern Spain. It is the seat of the Bishop of Huesca. Its architecture is Gothic, and its construction began in the late 13th century and was finished in the early 16th century. Located at 42.1404, -0.408722 (Lat. / Lng. ), about 0 miles away. Albero Alto is a municipality in the province of Huesca, Spain. As of 2010, it has a population of 132 inhabitants. Located at 42.05, -0.333333 (Lat. / Lng. ), about 7 miles away. Alcalá del Obispo is a municipality in the province of Huesca, Spain. As of 2010, it has a population of 491 inhabitants. Located at 42.0833, -0.283333 (Lat. / Lng. ), about 7 miles away. Alerre is a municipality in the province of Huesca, Spain. As of 2010, it has a population of 223 inhabitants. Located at 42.1667, -0.466667 (Lat. / Lng. ), about 4 miles away. 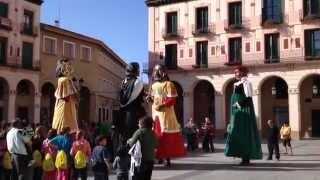 Argavieso is a municipality in the province of Huesca, Spain. As of 2010, it has a population of 119 inhabitants. Located at 42.05, -0.283333 (Lat. / Lng. ), about 9 miles away. Banastás is a municipality in the province of Huesca, Spain. As of 2010, it has a population of 270 inhabitants. Located at 42.1833, -0.45 (Lat. / Lng. ), about 4 miles away. Chimillas is a municipality in the province of Huesca, Spain. As of 2010, it has a population of 359 inhabitants. Located at 42.1667, -0.45 (Lat. / Lng. ), about 3 miles away. Loporzano is a municipality in the province of Huesca, Spain. As of 2010, it has a population of 540 inhabitants. Located at 42.1667, -0.316667 (Lat. / Lng. ), about 5 miles away. Quicena is a municipality in the province of Huesca, Spain. As of 2010, it has a population of 302 inhabitants. Located at 42.15, -0.366667 (Lat. / Lng. ), about 2 miles away. Tierz is a municipality in the province of Huesca, Spain. As of 2010, it has a population of 691 inhabitants. Located at 42.1333, -0.35 (Lat. / Lng. ), about 3 miles away. These are some bigger and more relevant cities in the wider vivinity of Huesca.